Short Story Review is the personal and review blog of Bonnie Jo Stufflebeam, reader and writer of short stories — primarily speculative fiction. Short Story Review is, for the moment, an occasional blog; it is on hiatus from regular posting while I work on my own writing. The purpose of Short Story Review is to give much-deserved attention to excellent short stories as well as to my own work, and so you will not see negative reviews here; if I don’t like a story, I simply will not review it. However, I will not keep from mentioning shortcomings of otherwise noteworthy stories. I welcome questions, comments, and critiques. Please feel free to contact me via Twitter @BonnieJoStuffle or on Facebook. I no longer accept review requests. For more information about my personal taste in short stories, see this post. For information about me, Bonnie Jo Stufflebeam, and to read some of my own short story publications, visit my personal website. 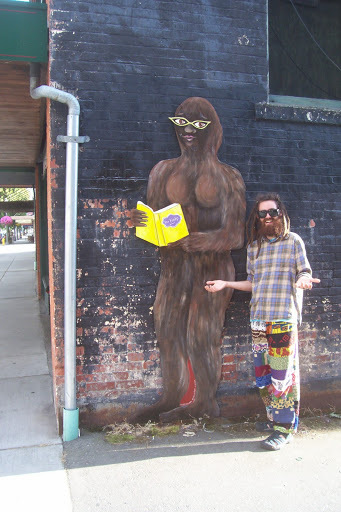 The male Sasquatch is rumored to be this guy.